The Unexpected continues to go in unexpected directions. I will happily continue using that phrase to start my reviews, as long as Orlando and Nord keep living up to the bar that they have set. Firebrand and Neon appear to be the core characters of the book, but June Robbins, from the Challengers of the Unknown, plays an important part in this issue, and a fairly big name shows up at the end. The story delves into the mysterious metals, and the creation of a “new” one. 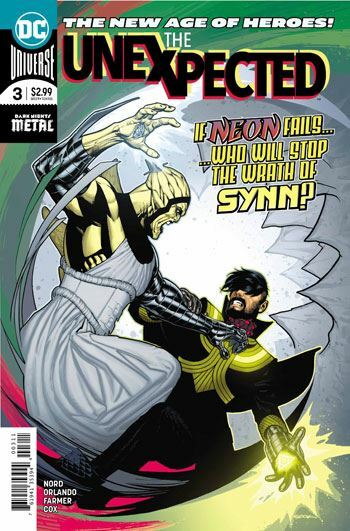 Honestly, much of what went down in the Metal series confused me, so the history lesson that June gives Firebrand and Neon was very welcome, in my eyes. Onimarr Synn finally makes it to Earth to confront the heroes and try to take control of the new metal. I’m glad that took place now, rather than dragging it out. The battle does not go as any of three had intended, which was also a nice touch. Keeping things off kilter seems to be what the book is working for, and, so far at least, is has kept the story engaging. I am also liking the dynamic between Neon and Firebrand. They have been thrust into working together, and one gets the sense that neither would actively choose the other as a partner. Again, this prevents them from feeling like a team, and keeps things a bit off balance. Art wise there are some really great camera angles that are used, and though I am incapable of specifying why, some of the work feels a bit like Mignola. It doesn’t look anything like Mignola’s work, which is why I am not certain that I get that sensation. But it’s a compliment, nevertheless. So three issues in The Unexpected has shown itself to be an odd but entertaining book, determined to keep things moving in fresh directions, and to keep the reader uncertain as to what is coming next. It works for me!